The Blue Bird Vision forges ahead as a leader in school bus safety. The Vision’s purpose-built, angled hood offers the greatest loading and unloading zone field of vision in a conventional Type C school bus. Its Safety View™ Vision Panel further increases the driver’s view at the critical lower right front loading and unloading zone. The instrumentation includes a driver-information-display panel to provide a wealth of system information to both drivers and service technicians. A choice of diesel or propane engines offers school bus customers an attractive array of fuel options to meet changing market needs. And with capacities ranging from 48 – 77 students, the Blue Bird Vision offers the flexibility needed for today’s transportation needs and the safety, quality, and durability to ensure that this school bus continues to meet those needs well into the life of the vehicle. For more information on how you can save an average of 50% of your fuel costs by using a Blue Bird Propane-Powered Vision, visit our alternative fuel products section. Blue Bird’s patented Safety View™ Vision Panel increases the driver’s view at the critical lower right front loading/unloading zone and adding a new level of safety to the Type C School Bus. Blue Bird’s trademark one-piece roof bows provide maximum rollover strength. Wiring is numbered and color coded for easy service, reducing downtime of the Blue Bird Vision. A variety of seat plans and configurations, including track seating and special needs options, offer customers optimal flexibility to meet specific passenger needs. One piece roof sheets from window top to window top add extra strength and durability to the Blue Bird Vision. Four full-length, 16 gauge exterior side rub rails are positioned to offer optimum strength and protection and are designed to resist penetration on side collisions; rails are dimpled at bottom fasteners to facilitate drainage and prevent corrosion. Drip molding visors are embossed in the Blue Bird Vision’s roof sheets over each window, minimizing corrosion by eliminating a need for an additional metal joint and permitting ventilation during inclement weather. Exterior side sheet metal is 20 gauge galvanized steel with fluting for strength; one piece from window sills to bottom of skirt, these side panels create a wall of protection around occupants. The Vision’s ergonomic wrap-around driver’s area put key functions, gauges, and switches where drivers need them the most. This accessibility ensures that driver attention remains focused, further contributing to the safety of the vehicle. Comfort Aire, Blue Bird’s integrated air conditioning offering, provides greater efficiency and quality than competitor aftermarket systems as the Comfort Aire system is designed in harmony with other OEM installed components. Mineral Wool Insulation provides better vertical integrity than fiberglass, adding to the total life cycle value of the Blue Bird Vision. Dedicated, purpose-built Blue Bird Vision Chassis delivers high levels of safety, quality, and optimization for extended life cycle value. The Vision’s Angled Hood offers the best forward sightline visibility among Type C conventional products. The Hendrickson Front Axle design achieves a 50-degree wheel cut for increased maneuverability and superior handling/steering, allowing drivers to navigate tight turns and reduce the need for backing up while on a route. A choice of Cummins, Ford and Roush engines caters to customers’ specific market needs with both diesel and propane fuel platforms; all Blue Bird engine offerings provide powerful performance while meeting or exceeding current emissions standards. Advanced electronics and diagnostics tools including a driver-information-panel (DID) provide a wealth of system knowledge to both drivers and service technicians. Easily adjustable tilt/telescoping steering column improves driver ergonomics and accessibility. The Vision’s Easy Hood Assist allows for less than 15 lb. of opening effort to access the engine compartment. Optional 100-gallon diesel fuel tank between frame rails in rear overhang ensures maximum protection while offering increased flexibility in routing. Premium components such as maintenance-free Huck Spin fasteners on all permanent frame fixtures contribute to the Blue Bird Vision’s strength and durability. A 3/16 inch thick, 12 inch high bumper with Blue Bird’s signature “A” frame bracing on corners adds strength and reliability to the Vision’s chassis design. We pride ourselves in our service after the sale. 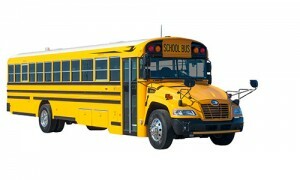 We offer a full line of Blue Bird School buses and can meet any of your pupil transportation needs. Cardinal Bus Sales is the authorized Blue Bird dealer for the entire state of Ohio and has been in business for over 30 years. ©2010 - 2019 Cardinal Bus Sales & Service, Inc. All Rights Reserved.